AUTOCAR MAGAZINE 7TH AUGUST 1964. THE DESIGNER AND HIS IDEAS. AUTOCAR MAGAZINE 16TH SEPTEMBER 1966. ALPINE RALLY REPORT. JACK BRABHAM OBE. AUTOCAR MAGAZINE 27TH MAY 1966. JACKIE STEWART ON RACING. 5 pages including cutaway drawing and in good condition. I can send a larger and clearer picture if requested. 6 pages and in very good condition. I can send a larger and clearer picture if requested. AutoCar Magazine. 29 November 1963, 66 pages and in very good condition. I can send a larger and clearer picture if requested. 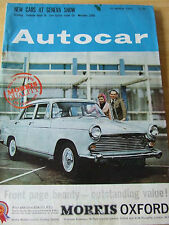 AUTOCAR MAGAZINE 6TH APRIL 1962. RALLIES: THE WILL TO FINISH. MOTORIZED CARAVAN CHOICE. Rallye Sport. VAUXHALL CRESTA ESTATE CAR. AUTOCAR MAGAZINE AUGUST 10TH 1967. BMC AND JAGUAR THE BMH STORY. NEW 1967 VOLKSWAGEN MODELS. LANCIA FULVIA 1.6 HF. AUTOCAR MAGAZINE 27TH NOVEMBER 1969. RAC RALLY REPORT. THE ROVER STORY. Rallye Sport. AUTOCAR MAGAZINE AUGUST 24TH 1967. NEW BOND GT DESCRIBED. March 8th 1963, AUTOCAR, Volksagen 1500 Estate, Lancia Fulvia, Triumph Herald. NEW MODEL - LANCIA FULVIA. NEW MODEL - TRIUMPH HERALD 12/50 (6881 VC). MARCH 8th 1963. MOTOR CARAVANS FOR 1963 - CHOICE OF 21 MAKES. I am not saying that most of them are not in a collectable condition but as we do this partly for charity i find it a much safer market. BRABHAM CLIMAX. AUTOCAR MAGAZINE 31ST JULY 1964. Car Mechanics Monthly Cars, 1960s Transportation Magazines"